A cattle byre (luak) with thatched roof already in place, the walls unfinished. Just in front of the structure can be seen forked branches with horizontal poles placed across, seemingly surrounding it. 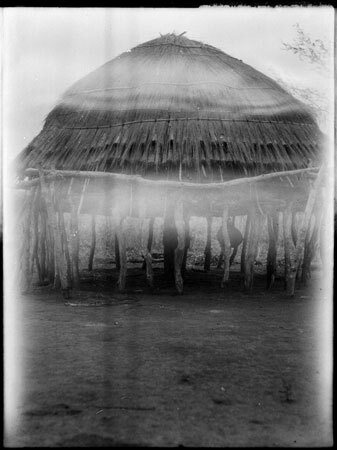 Men as well as cattle spent the night in such byre (luak) s, with a dung fire kept burning to keep away mosquitos and other biting insects. Morton, Chris. "Nuer cattle byre" Southern Sudan Project (in development). 03 Jan. 2006. Pitt Rivers Museum. <http://southernsudan.prm.ox.ac.uk/details/1998.346.336/>.